Combination workouts bring two or more disciplines into a single workout, either for convenience or for specific race preparation. The most common combination workouts are swim to bike, bike to run (usually called a brick), and run to bike, depending on the goals of the triathlete and time of year. A small segment of the triathlon population experiences some lightheadedness when transitioning from the prone position of swimming to the standing position of running, as triathletes do when moving from the swim to the first transition. Another small segment of the triathlon population experiences unusual leg fatigue going from swimming to running and then cycling.For these triathletes, one strategy is to set up a bike on a trainer on the pool deck. Triathletes can begin with an easy swim of 500 meters or so and then transition to the trainer for an easy spin of around 10 minutes. They repeat this sequence two to four times in a single workout. If the triathlete is not adapting or feels so lightheaded that passing out is a possibility, a doctor should be consulted to be certain that no medical issues are present. Depending on the severity of the problem, triathletes may want to be checked out before doing any swim-to-bike workouts. As triathletes adapt to the easy swim-to-bike workouts on the pool deck, they should increase intensity by following a fast swim segment with an easy ride. The second round should be an easy swim followed by a faster ride. As adaptation to the transition between swimming and cycling continues, the triathlete can increase the intensity of both the swim and the ride. Many triathletes do swim-to-bike workouts as a matter of convenience, particularly on weekends. Many do a pool workout and then head straight to a bike workout. With workouts sequenced in this manner, they can decide which workout or workouts should include intensity. As triathletes approach race day, they may want a swim-to-bike workout as a dress rehearsal for race day. Swim-to-bike and run-to-bike workouts are often called combination, or combo, workouts. The bike-to-run workout is often called a brick. Although the history of the word is not clear, one theory is that the name was given to the workout because when triathletes go from fast cycling to running, their legs feel like bricks. To help triathletes adapt to the change of body movement and muscle recruitment from cycling to running, and the feeling that this change produces, aerobic brick workouts are a good place to start. Some prefer to do brick workouts every week throughout the training plan, but others limit brick workouts to once per month, perhaps as a workout during a recovery week. Others limit brick workouts to certain macrocycles. No standard has been set about how often to perform brick workouts, and some triathletes appear to make this adaptation better than others do. In one study on elite international Olympic-distance racers, the intensity of cycling did not have an adverse effect on neuromuscular control and running economy. Even moderately trained triathletes experienced little influence on running muscle recruitment after cycling. These studies may lead the reader to believe that experience in the sport of triathlon eliminates any effect of cycling on running economy and muscle recruitment, but that is not true. A third study found that despite years of training, some elite triathletes do experience changes in leg movement and muscle recruitment in running after cycling. The effects of cycling on neuromuscular control and running economy appear to vary among people. When deciding how many bricks to include in a program, triathletes should consider their experience level, goal race distance, and race results. Slower sprint- and Olympic-distance racers are more likely to do short brick workouts. For faster sprint- and Olympic-distance racers, brick workouts are often in the range of 50 to 100 percent of race distance. For half-Ironman racers, bricks are often 25 to 50 percent of race distance. For Ironman racers, bricks become less important because the need for blazing fast transitions is not an issue except for the top triathletes. For Ironman racers, the benefit-to-risk considerations of long brick workouts need to be evaluated. For example, how much value is gained from doing a 60-mile (100 km) bike ride followed by a 10- to 13-mile (16 to 20 km) run? Would this triathlete be better served by entering a half-Ironman race and using that race as part of the training strategy? Is the triathlete prone to running injuries? What is expected to be gained from the brick workout? Individual athlete strengths and weaknesses need to be considered when making training decisions. 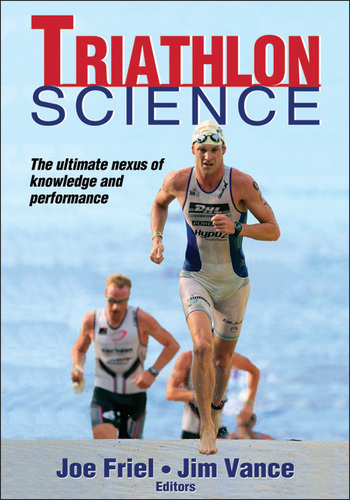 The bias should be toward conservative undertraining so that the triathlete remains injury free and mentally sharp. - Aerobic ride followed by an aerobic run. - Aerobic ride followed by a run that includes some portion at current training-cycle intensity. This run can be a steady effort or broken into intervals. - Ride that includes some portion at current training-cycle intensity. This ride can be a steady effort or broken into intervals and is followed by an aerobic run. - Ride followed by a run in which both disciplines include some portion at intensity. Duathlon T1 is easier to practice than triathlon T1 for most triathletes. Any yard or garage can be turned into a mock T1 area. The duathlete can go for the assigned run, return home, complete the transition, and head out on a bike ride. - Run 5 kilometers, doing the last 1.5 kilometers at race pace. Immediately transition to an easy ride of 10 kilometers. - Run 2.5 kilometers at aerobic intensity. Transition to a 15-kilometer negative-split ride. Begin at aerobic intensity for 7.5 kilometers and then ride the last 7.5 kilometers at close to race intensity. Faster duathletes can finish at zone 3 to 5a intensity and build from zone 3 to 5b in the second half of the ride. - Run 5 kilometers, doing the last 1.5 kilometers at race intensity. Immediately transition to a ride of 15 kilometers. Make the first 7.5 kilometers at race intensity and finish at aerobic intensity. The design of the workout should have intent for the duathlete. That intent may be transition practice, muscle recruitment when changing disciplines at an easy pace, or race-pace rehearsal. New and intermediate duathletes may consider making the workout distances less than race distances. Top duathletes may want the distances to be the same as race distances. They may perform only a portion of the workout at race pace so that they save the best performance for race day. I own most of the “Anatomy” series from Human Kinetics. They are well illustrated, easy to understand, to the point, and all-around excellent references. Now this new one is offered as an eBook. participation becomes more popular, the research literature on best practices and training methodologies expands at a staggering rate. Although the science of effective training is certainly important, so is the art of developing a training plan. Triathlon coaching has been an area of explosive growth over the past decade. A range of professional triathlon coaching certifications is now available, and scores of coaching companies, large and small, have sprung up to meet the growing demands of this burgeoning field. Developing a multisport training plan can be daunting, and as athletes attempt to train effectively for three sports, they discover that a knowledgeable coach can save them time and headaches by shortening the learning curve. But although coaching does involve the science of training, it’s also important not to neglect the art of training an athlete. After all, if human performance improvement was as simple as adding 1 and 1 to equal 2, everyone would be getting faster and competing at a similar level. The truth is that each athlete is an experiment of one, and a good coach will discover the balance of training in order to help the athlete reach his goals while remaining healthy and injury free. Hence, the art of training. In many ways, a triathlon coach is like a chef. Every chef has access to common ingredients. It’s how they mix, prepare, and then present the ingredients to create the dish that matters. And let’s face it: Some dishes are great while others are not so great. It’s the same with triathlon coaching and how the coach works with the athlete, addressing individual strengths and weaknesses in order to develop the ideal program for achieving goals. Let’s begin our discussion of developing a training plan by exploring the basic ingredients that all triathlon coaches have at their disposal. Planning and strategic oversight of a program are important, and when it comes to designing a training plan, the first step is to determine your ultimate goal for that season. We’ll call this your A race. Next, you’ll need to determine races of lesser importance you’ll use in order to gain competitive experience and develop your race legs. Many elite athletes use these B and C priority events as hard training days to race themselves into shape, both physically and mentally. Once the race schedule is mapped out and the commitment is made, it’s time to start developing your plan, working backward from your A race and using the principle of periodization. Your training ingredients include the variables of intensity, duration, and frequency; the mixture of these components will enable you to develop an effective plan. For a more nonlinear approach to periodized training, focus on certain energy systems for periods of 4 to 6 weeks, while also incorporating training intensities to bolster other systems simultaneously, because no one energy system is developed at the exclusion of others. For example, an aerobic base development phase will also include some bouts of short, intense work that targets the anaerobic energy system. This makes the transition to a more specific block of hard training much easier while lowering the risk of overtraining and injury. In addition to cardiorespiratory and sport-specific training, most coaches and athletes now agree that supplemental strength and flexibility training is crucial for enhanced performance and, more important, long-term health and well-being. Supplementary resistance work should be done year-round using a selection of exercises found in this book, with an approach that complements the seasonal training needs of the athlete. For example, when an athlete is in season, the focus of a strength training routine is mostly maintenance and injury prevention. On the other hand, during the preseason, the training focus is more on developing strength and a biomechanically sound foundation. Table 3.1 shows a sample preseason program used by a beginner to intermediate-level triathlete with one to three years of experience who is preparing for an Olympic-distance triathlon. The emphasis is on aerobic base and basic strength development, with a total training commitment of 10 to 12 hours per week. From this example, you’ll notice that each sport discipline is trained at least three times during the week in addition to three strength training sessions. Athletes should perform sport-specific training before strength work in order to ensure good form and enable solid development of technique. Muscles that are tired because of resistance training can foster poor movement patterns when swimming, cycling, and running, impeding efficiency and wasting energy. With such a wide variety of strength training exercises from which to choose, it’s imperative that you have a focused strategy for continual improvement. Using the expert help of a coach or certified personal trainer, choose from the recommended exercises in this book to create a plan tailored to suit your individual needs. Like my three-year-old nephew said at a college football game, “It’s game day, baby!”. Relax, enjoy the race. There’s nothing more you can do other than execute your race plan. All the training is behind you. Pace yourself When the gun goes off, some riders go out fast. Unless you’re going for a personal best, avoid getting caught up with them. Choose your groups wisely and pace yourself. In the excitement of the start, you may go faster than you should, so take it easy for the first 30 minutes. Remember that the group riding your pace is often behind you! If you are using a heart rate monitor, keep in mind that your heart rate may be elevated compared with what you experience on training rides, so you may be better off using perceived exertion as a guide. With a power meter current wattage fluctuates a lot. Try to keep it in the same range as you do during your long training rides. Check your cue sheet Put one copy of the cue sheet in a map holder on your handlebar, carry it in your jersey pocket, or tuck it up one leg of your shorts for quick reference. Stow the other copy in another location. Some organizers paint arrows on the pavement to show the turns, but if other rides have been routed through the same area, determining which arrows to follow can be difficult. Don’t assume that other riders are following the course correctly; double-check each turn yourself. Ride with a group Riding with a group increases the fun; however, pay attention to your ride even during a fun conversation. Even if you aren’t the first rider, look down the road for potential problems and point them out to your group. Ride smoothly in a straight line and signal or call out before you move or change speed. Don’t overlap front and rear wheels. Ride in a pace line If it’s windy or the pace is above 15 miles per hour (24 km/h), you can save a lot of energy by riding in an organized pace line. Remember the protocol: Ride at a pace everyone can sustain, take short pulls, look carefully for traffic before you drop to the back, drop to the traffic side of the line if a crosswind isn’t blowing, and drop to the windward side if it is. Be cautious when riding in a pace line with unfamiliar riders who may not know the protocol. Eat and drink The first hour goes by quickly. Start eating in the first hour. Depending on your body size we recommend consuming a mix of carbohydrate totaling 60 to 90 grams, or 240 to 360 calories, plus a little protein and fat, during each hour of riding and drinking to satisfy your thirst. Nibbling on a variety of carbohydrate during each hour will work better than eating one thing on the hour. Use your experience from the weekly long rides to guide you;what worked on them will work on the century. If you might forget to eat or drink, set your watch to remind you. Take advantage of rest stops Rolling into an aid station during your ride feels great. Take advantage of what they offer but use them wisely. View them not as places to rest but as resupply stations. If you have tight muscles, stretches using your bike will loosen you up (see figures 7.2 through 7.4). When you arrive at a rest stop, park your bike carefully to avoid thorns and other potentially hazardous debris. Before leaving do a quick bike check: Are your tires hard? Are they clean? Are your brakes working? Enjoy the company of others but avoid lingering so long that you get stiff. Use the restroom, fill your bottles and pockets, and get back on the road. Before you leave, thank the volunteers because without them rides like this could not exist. When reentering the road watch for cars and other bikes and ease back into your pace as you did at the start. Mentally manage the ride During your century, problems may occur. Don’t panic—almost anything can be solved. Take a deep breath, relax, and diagnose the problem. Is the problem with the bike? Riding with a soft tire or a rubbing brake can be a drag—literally. Are you getting repeated flats? Make sure that nothing is embedded in the tire or protruding from the rim strip. If you are down mentally, have you forgotten to eat or drink? If your legs are tired, did you go out too hard? Mentally review your three basic scenarios. If you have forgotten to eat, don’t try to make up the calories immediately because doing so may give you digestive problems. Instead, just get back on schedule. If you have gone out too fast and your legs are trashed, slow down for a while, regroup, and adjust your expectations. Your energy level and emotions will fluctuate during the ride. You may find that after slowing down for a while your energy will return. Above all, whatever happens, remember that this is your ride. You still can have fun and finish. Looking for something new to enhance training? “For every sport and fitness category described in the following sections, inspiratory muscle training (IMT) will improve exercise tolerance or performance by delaying the onset of the inspiratory muscle metaboreflex and reducing the perception of breathing and whole-body effort. These sections summarize the additional benefits. For those engaged in general fitness training, IMT will make exercise feel easier, which enables people to maintain higher exercise intensities for longer durations. This enhances the fitness gains and caloric expenditure of general fitness conditioning. The rate of perceived recovery will also improve, which will enhance the ability to maintain the tempo of activity during exercise-to-music classes and the intensity of circuit training. The enhancement of core stability will reduce injury risk and improve weight training. Weight trainers will benefit from improved core stability, which may produce an improvement in maximal lift performances for lifts where trunk stiffness and stability contribute to the ability to overcome a load (e.g., Olympic lifts). 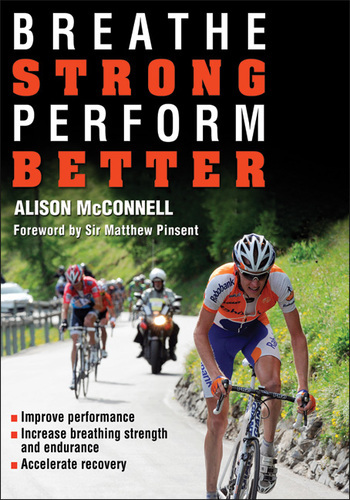 A wide range of endurance sports are reviewed here, but the principles that have been applied can be adapted to suit any sport. IMT will improve the runner’s ability to maintain a deeper, slower breathing pattern. It will also enhance the efficiency of respiratory and locomotor coupling (entrainment), enhance core stability (reducing spinal loading and improving leg drive efficiency), and improve postural control (balance). IMT may also reduce the risk of developing a side stitch. IMT will improve the cyclist’s ability to maintain a deeper, slower breathing pattern. It will also enhance the efficiency of respiratory and locomotor coupling (entrainment) and enhance core stability (reducing spinal loading and knee stress and improving pedaling efficiency). IMT will also allow the inspiratory muscles to operate more comfortably in extreme cycling positions (e.g., when using aerobars). The addition of IMT to swim and other aquatic training will improve the swimmer’s ability to maintain a deeper, slower breathing pattern and will enhance the efficiency of respiratory and locomotor coupling (entrainment). IMT can also enhance the swimmer’s ability to inhale rapidly and to achieve and sustain high lung volumes. As a result, the swimmer’s body position and stroke mechanics will be improved. A decrease in the number of breaths per stroke will also be possible. In addition, the muscles of the trunk will be better able to meet the dual demands for breathing and providing propulsive force. Those using scuba will also benefit from a deeper, slower breathing pattern, which reduces air use and extends cylinder wear time. Furthermore, free divers and surfers may also experience an improvement in breath-holding time. Breathing restrictions imposed by wet suits will also be easier to overcome or tolerate after IMT. The addition of IMT to multisport training will provide the benefits summarized for each component. Most triathlons involve a wet suit swim, and IMT will enhance the swimmer’s ability to breathe efficiently and comfortably. Furthermore, the unique breathing-related disruption that occurs during the transition from cycling to running will be alleviated. The addition of IMT to rowing training will improve the rower’s ability to maintain a deeper, slower breathing pattern; enhance the efficiency of respiratory and locomotor coupling (entrainment); and enhance core stability and trunk stiffness (reducing spinal loading and improving force transmission to the blade). Furthermore, improvements in intercostal muscle function and the ability to generate and maintain high intrathoracic pressure may reduce the risk of rib stress fractures. IMT will also allow the inspiratory muscles to operate more comfortably at the catch and finish positions. People taking part in sliding sports have a number of factors influencing their performance, including the effects of altitude and the challenges associated with maintaining balance. IMT will improve their ability to maintain a deeper, slower breathing pattern. It will also enhance the efficiency of respiratory and locomotor coupling (entrainment), enhance core stability (reducing spinal loading and improving leg drive efficiency), and improve postural control (balance) and trunk stiffness. The ability to maintain aerodynamic postures for longer periods without the associated breathing discomfort is another benefit of IMT. Hikers and mountaineers have to contend with the effects of altitude, the impact of carrying heavy backpacks, and the challenges associated with maintaining balance on unpredictable terrain. IMT will improve their ability to maintain a deeper, slower breathing pattern; enhance the efficiency of respiratory and locomotor coupling (entrainment); and enhance core stability (reducing spinal loading). The challenges to postural control (balance) imposed by carrying a backpack and by traveling on uneven terrain will be minimized by IMT, and trunk stiffness will be improved. In addition, the ability to overcome the resistance to normal breathing movements of the trunk that are induced by backpacks will be improved. Team sports are diverse in their challenges, but they all have three important factors in common: They involve repeated high-intensity efforts that drive breathing to its limits; they require the contribution of the upper body and the core-stabilizing system (e.g., fending off opponents, changing direction quickly, or passing objects to teammates); and they require tactical decision making at a time when the distraction from breathing discomfort is high. IMT will improve the rate of perceived recovery between sprints, which will enhance repeated sprint performance and the quality of interval training. These improvements in perceived recovery should enable players to maintain the intensity of their involvement in the match or game, rather than back off for a period of “cruising” recovery. In addition, the damping down of breathlessness will lessen the distraction that this sensation imposes on tactical decision making. Improvements to core stability will advance a player’s effectiveness during physical interactions with opponents (e.g., tackling, fending off) and in activities such as kicking and throwing. For contact sports and those that involve activities requiring the application of whole-body isometric forces (such as a rugby scrum), players will benefit from the increased ability of the inspiratory muscles to function as breathing muscles. This is important in situations where the demand for breathing is high but the requirement for maximal core-stabilizing activity is also present. Finally, in those contact team sports requiring the use of mouth guards and other protective equipment, IMT can improve breathing comfort and reduce the risk of inspiratory muscle fatigue that results from the restrictions imposed by the equipment. Sports falling under this heading most commonly require the participants to use an implement to strike a ball—such as a racket (e.g., tennis, squash, badminton), club (e.g., golf), or bat (e.g., baseball, softball, cricket)—or they may be sports that involve throwing a ball (pitching and bowling). In the case of racket sports, the player is required to direct the ball within the bounds of the court using a range of strokes. Matches are fast paced, requiring speed, agility, and skill. In contrast, in sports such as golf or baseball, the player is able to square up to the ball or pitcher and is stationary as the ball is struck. These two scenarios create very different demands on the breathing muscles, but there are two common denominators: the involvement of the trunk musculature in providing a stable platform and in protecting the spine; the contribution of the entire trunk musculature to the task of accelerating a racket, club, bat, or arm. After using IMT, players in racket sports will be able to maintain a higher tempo of performance during rallies, and they will experience a reduction in unforced errors. Rate of perceived recovery between rallies will also improve, which will enhance the ability to maintain and dictate the pace and tempo of the game. In addition, the damping down of breathlessness will lessen the distraction that this sensation imposes on tactical decision making. The enhancement of core stability and improved contribution of the trunk musculature to racket head speed and precision will increase the likelihood of aces and shots that are “winners,” as well as reduce the risk of injury. If you are looking for a new bike or want to upgrade your current bike, write down the answers the following questions so you can discuss your options at the bike shop. Do you have bike fit concerns? A bike that fits is the most important factor in comfort and performance. If you are particularly tall or short, a woman, or have orthopedic issues such as back trouble, a standard frame design may not fit you correctly. The bike should fit the rider, not vice versa. You can modify bike fit by selecting the right components, but you need to start with a frame of the right size and shape. We describe proper bike fit in detail later in this chapter. Many bike manufacturers have frames and components specifically designed for women. Women tend to have shorter torsos relative to their legs, and these frames fit women’s body proportions better than generic frames do. Women’s bikes usually come with smaller handlebars, crank sets, and brake levers to make riding more comfortable. Erika is 5 feet, 4 inches (163 cm) tall and should look at frames made for women. How much do you want to spend? Plan to spend close to US$1,000 for a durable entry-level bike that can withstand the demands of training for and riding centuries. Check out the websites of various manufacturers. The difference between the entry-level bikes and the top models is often the component groups. In many cases, the frames are virtually identical. If you are on a budget, you could get one of the lower-end bikes and then upgrade the components as you can afford them, although components bought later are significantly more expensive than if purchased on the original bike. Also, look for last year’s models. You may save some money when dealers clear their inventories for the next year’s models. There is no ceiling on price if you opt for a custom-designed frame with top-of-the-line components. At what level do you want to perform? If you want to get in shape and complete a few centuries a year, almost any standard road bike will do the job. Consider entry-level road bikes, often referred to as sport, fitness, or comfort bikes (see figure 5.1), which are suited for everything from commuting to centuries. On the other hand, if you aspire to fast times and may race one day, a racing bike with lighter components may suit you better. Improving your century or brevet times requires more training, and riding greater distances generally puts more stress on the components. Higher performance bikes usually feature better components and lighter frames. Lighter components cost considerably more and are less important than other considerations for most riders. In the future might you ride longer brevets or multiday tours? Events of 300 kilometers, 200 miles and longer, and tours require many hours or days on the bike, so cycling efficiency and comfort are essential. Racing bikes are the most efficient and suitable for many riders doing longer events. A touring bike, however, which is designed a bit differently from a racing bike, is generally more comfortable because the rider sits more upright. These bikes are more stable than a racing bike with a load of gear. The choices range from those designed to carry a very large seat pack and handlebar bag, suitable for rides up to a 1,200-kilometer randonnée, to those with attachments to carry all the gear needed for a self-supported camping trip. You could comfortably ride a century, 200 kilometers, or longer on most touring bikes, although they are heavier and less efficient. How reliable must the bike be?Road and touring bikes by reputable manufacturers are all quite reliable. Although problems will be infrequent, some components and wheels designed for lightness and higher performance will have more breakdowns than those with more robust designs. Repair of these equipment problems may require a bike mechanic. If you don’t want to risk an equipment failure that may prevent you from finishing an event or are considering self-supported rides, pay attention to the reliability of components and the ease of repairing them. 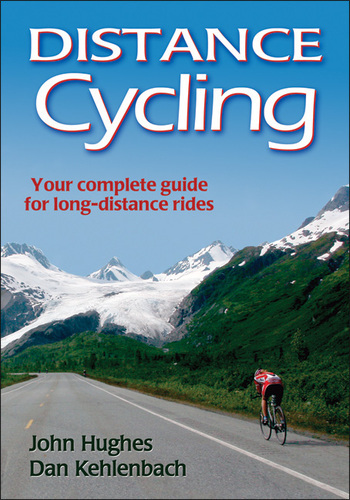 Human Kinetics author of, “Cycling Fast” author Robert Panzera interviewed. TFMS 005: Robert Panzera of Cycling Camps San Diego on Strength & Conditioning, Goal Setting, & Periodization Training from Fit Marriage on Vimeo. This is an excerpt from Cycling Fast. It’s published with permission of Human Kinetics. “Training with a power meter is the current gold standard for measuring improvement in performance and setting standardized goals for workouts. 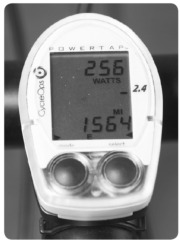 A well-calibrated power meter provides an absolute measurement (in watts) of the power generated by the cyclist. For comparison purposes, wattage is paired with body weight, normally taken in kilograms. For example, a 140-pound (64 kg) rider who produces 300 watts can be said to produce 4.69 watts per kilogram (W/kg; that is, 300 W divided by 64 kg). Similarly, a 170-pound (77 kg) rider who wants to achieve the same 4.69 watts per kilogram needs to produce 361 watts. Table 4.6 provides a list of the target wattage needed for each category of racing. Purchasing a power meter is an economic investment. You may find power meters that cost around US$400, but some may cost as much as US$2,500. Only a few companies develop power meters. Some power meters use the bottom bracket as the source for extrapolating power, others use the rear wheel hub to extrapolate power, while still others use wind velocity and rider drag to extrapolate power. Higher price does not necessarily mean a better power meter. Explore the available options by talking with other riders who own power meters, local bike shops, and your coach. This will help you find out which system works for you. Knowing your sustained power (wattage) at a select time interval will give you guidelines for specific workouts. Standard time periods include 5 seconds, 1 minute, 5 minutes, and 20 minutes. Using a 20-minute sustained power test is the most common way to determine training zones. The five zones identified in table 4.7 will provide an effective platform for structured training. The test described in this section will estimate your 20-minute sustained power (SP). Your 20-minute SP number may increase throughout the season as your fitness increases, or the way you achieve your 20-minute SP may change throughout the season (e.g., at 95 rpm instead of 85 rpm). Although not covered in this book, if you want to fine-tune your fitness, you can perform 5-second, 1-minute, and 5-minute SP tests. With this information, you can choose workouts that target and cover these time periods. For example, you can use sprint workouts to improve 5-second SP or intense on-the-bike strength workouts to improve 1-minute SP. You must be fully rested before performing the 20-minute test. Make sure you read the instruction manual for your power meter to determine how to mark each interval; you can then review and record the data and wattages later. The best conditions for performing the test are on a flat road (or a road with a slight rise) with steady wind and limited traffic, traffic lights, and stop signs. A closed park road with few pedestrians is ideal. The test can also be performed on a stationary trainer (if the trainer provides even resistance throughout the duration of testing). Before performing any maximum efforts, you need to be in good physical health as confirmed by a medical professional. Ride steady and easy in the warm-up with heart rates at less than 75 percent of maximum for 30 minutes. Near the end of the warm-up, perform one 5-minute (1 × 5 min) effort at 95 percent of what you estimate to be your time trial heart rate. Then perform active recovery—rolling at cadences between 70-85 rpm at <75 % of maximum heart rate (MHR)—for 5 minutes. (A discussion of MHR follows in the next section.) Next, perform three 1-minute (3 × 1 min) high-cadence (>100 rpm) efforts in the easiest gear. Perform active recovery for 1 minute between the 1-minute intervals. After the three 1-minute efforts are complete, perform active recovery for 4 minutes. Mark interval and start a 20-minute all-out time trial effort with cadence at 85 to 95 rpm. For the first 3 minutes, ease into a time trial pace. Record all test conditions, including the course, weather, wind, and temperature. Also record your diet for the day before and the morning of the test. During the test, you need to remain mentally focused. Pacing during testing is crucial—meaning building by increasing power throughout, as you would in intervals. Attempt to maintain the highest average watts for the test period. “Climbs and descents make or break cycling races, according to cycling coach Robert Panzera. In his upcoming book, Cycling Fast (Human Kinetics, May 2010), Panzera covers hills and all elements that can make a cyclist faster, from conditioning to nutrition and key skills. 1. Be near the front for corners that are followed immediately by hills. ‘This helps you prevent being gapped,’ explains Panzera. 3. Close gaps on hills immediately, but with an even, steady pace. ‘Once the group starts riding away on a hill, it is nearly impossible to bring them back,’ Panzera warns. 4. Keep the pace high over the crest of the hill, because the leaders will increase speed faster than the riders at the tail of the group. 5. Relax and breathe deeply to control heart rate on climbs. 6. Dig deep to stay in contact on shorter climbs. ‘Once a group clears the top, it is difficult to catch up on the descent,’ says Panzera. 7. On longer climbs, ride at a consistent pace that prevents overexertion. 8. Always start climbs near the front. If the pace becomes too fast, cyclists will be able to drop through the pack and still recover without losing contact with the pack. 9. Hills are a good place to attack. ‘Know the hill’s distance and location in the course before setting out on an attack or covering an attack by a competitor,’ advises Panzera. 10. Try to descend near the front, but not on the front. Being near the front, as opposed to the back, gives cyclists a greater probability of avoiding crashes. This is an excerpt from Mastering Cycling. It’s published with permission of Human Kinetics. Howard stresses the importance of cyclists’ developing more power, comfort, and safety for riding on the streets in traffic, negotiating turns and terrain, and dealing with road hazards, including other cyclists. “Equipment has evolved, speeds have increased, and the rigors of competition have tightened, but the basic techniques aren’t being taught to masters cyclists,” Howard says. In his upcoming book, Mastering Cycling (Human Kinetics, July 2010), Howard addresses the top technical skills that are essential for every cyclist. When climbing out of the saddle, the goal is to maintain a consistent heart rate and increase forward momentum. “Gravity will win the battle if you surge on the pedals, pull and push your upper body forward or backward, or worse, pull your upper body up and down, disengaging the important core muscles,” Howard says. “The primary force in moving the bicycle forward is generated at the 3 o’clock and 9 o’clock positions of the cranks.” A common mistake among less-experienced riders is mistiming the thrust of the cranks. Power is dissipated at the top and bottom of the stroke, which is essentially a dead zone when out of the saddle.